Infos: This is not a real clip. It is actually a recording of the band playing in the studio of the German TV channel VIVA during the promotion of Imaginations From The Other Side. Infos: Bright Eyes is the official video clip for Imaginations From The Other Side. The production is a bit messy: it is too quick and the colours are saturated. 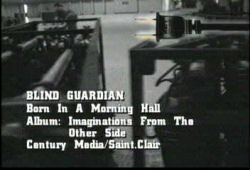 The band, recorded in a hangar, is the central point despite the story about a young boy. Infos: This is a quickly done videoclip: live shows recording, some backstage stuff and here you go: the clip for Born In A Mourning Hall. This is all right but not really original. Since all the live recordings came from the Imaginations From The Other Side tour, the clip does not appear on the album. 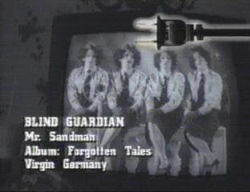 Infos: Mr. Sandman is probably the strangest clip of a Blind Guardian song. 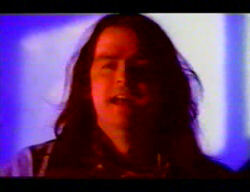 It was produced by Virgin (the label for the band at this time) and shows the passion of Hansi for Stephen King. The reference to the clown of "It" is easy to see. 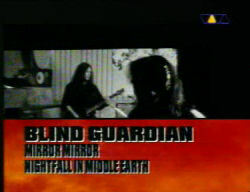 Infos: We could have expected a nice videoclip for a song taken from Nightfall in Middle-Earth, but Blind Guardian actually released a simple clip with studio shoots of the band recording. 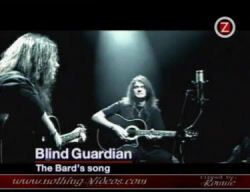 Infos: Here is the clip of the ultimalte Blind Guardian’s ballad: The Bard's Song (In The Forest). Expected by all the fans, we would have thought that the band would released an interesting video. This is simply a recording of Hansi, André and Marcus playing on bar stools. 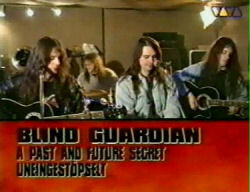 Infos: This is at least a real videoclip for Blind Guardian. The story in the lyrics is shown on screen by characters and their acting is convincing. The reason for this change might be the signature on Nuclear Blast. The fans at least were happy as they were awaiting for a serious video for years. Infos: For his second "real" clip, Blind Guardian offers us a journey to the land of the Aztecs. Travel unfortunately a little bit too kitsch and whose images don't fit at all with the story told by A Voice In The Dark ... 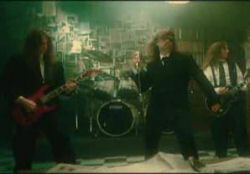 Finally this is a poor quality clip that the band offers here and this will always be their greatest weakness.